"Tiger’s second place yesterday was his best performance in a major championship since he was caught and passed by Y.E Yang at Hazeltine in the US PGA nine years ago. It was a fabulous effort this week and although he traded shorter at Carnoustie, he impressed me more here but is he going to get that illusive 15th major championship or has this summer just been the epitome of a dead cat bounce?" 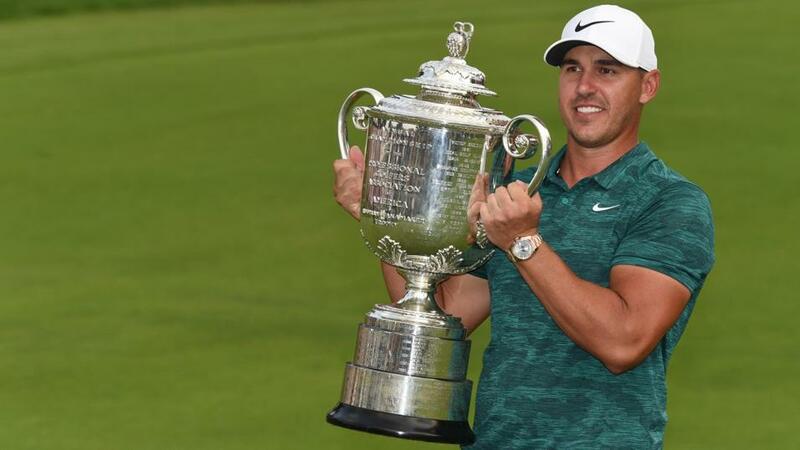 The 100th US PGA Championship has gone the way of Brooks Koepka, in his 100th PGA Tour start. The 28-year-old Floridian was generally a [23.0] chance before the off but he hit a high of [85.0] after a slow start, which saw him make the turn on day one on two-over-par. He started the US Open in similarly slow fashion before moving serenely through the field in round two and this was almost a carbon copy of his imperious performance at Shinnecock last month. Having entered the final round with a narrow lead, Brooks birdied his opening hole to give himself a bit of breathing space but back-to-back bogeys at four and five made it interesting as challengers arrived in the shape of Justin Thomas, Tiger Woods and Adam Scott. Thomas drew level and he was matched at a low of [2.8] when he had seven feet for birdie at the ninth but incredibly, he missed both that and the returning par save from four feet and that was the end of his challenge. To his credit, he bouncd back with birdies at 10 and 11 but the damage was done. Tiger Woods had performed poorly on the back-nine all week long but when he rolled this birdie putt in on 13th yesterday he was matched at a low of [4.9] and golf fans across the globe were starting to get giddy. Unfortunately for Big Cat fans, that birdie was immediately followed by a bogey at 14 and it was left to Scott and Koepka to fight out the finish. After back-to-back birdies by Scott, the two were locked together with five to play and the Aussie was matched for plenty at around the [2.3] mark but Koepka soon reasserted himself at the top with back-to-back birdies of his own at 15 and 16 and the result was never in doubt after that. Having backed Brooks before the off it was a very straightforward week and having the likes of Dustin Johnson, Justin Thomas and each-way pick, Gary Woodland, all in-the-mix throughout the week meant I didn't really get too involved in-running. The book always looked nice and healthy. It wasn't as if I wasn't looking for alternatives to those picked out before the off but as highlighted in the In-Play Blog, I thought Brooks looked the value at halfway and I thought it was damn near impossible to pick an alternative with so many just behind him with a round to go. I did have a small bet on Francesco Molinari at [100.0] in-running last night and I backed both Scot and Woods at huge prices with a couple of holes to play, just in case something bizarre happened but prior to that, the end was a bit nerve-wracking as I didn't back Scott or Woods early on. I fancied Koepka to get the job done when it was clearly just a three-man race, I'd already layed him at odds-on on Saturday, and with two players challenging him, it would have diluted the winning far too much if I'd have covered them both so I decided to let it ride. With hindsight, I needn't have backed either of them at all but I was more than happy to pay a little for insurance very late on so I could enjoy a celebratory beer or two. I watch a lot of golf and I'm often confined to my office to do so but occasionally I don't want to sit on my own for hours on end so I'm quite used to slapping the headphones on to watch on my laptop or pad in the living room with everyone else. Maybe that's why I didn't really mind signing up to the free trial with Elevensports to watch this year's renewal of the US PGA Championship and I'm glad I did. Whether you blame the PGA, Sky, or the regulators for trying to input some competition to Sky for the reason we had no TV coverage of the year's final major is irrelevant really. It is what it is and I suspect we're going to be faced with more decisions as to how and where we get out sports fixes going forward but if it's anything like last week's coverage I don't mind it at all. ElevenSports received all sorts of trivial complaints via Twitter but I thought the coverage was fine. Okay, we didn't see every single important shot on Sunday but that happens with Sky too and there was a noticeable delay between the market and the action but again, that's the same every week on Sky with the PGA Tour events (far less so with European Tour events). I enjoyed the chemistry between commentators Dominik Holyer and Jamie Donaldson and I don't really have any complaints. And it didn't cost anything! I agree with Mark, it seems a bit daft to give them so much stick. With the US PGA Championship moving from August to May, and with the WGC-Bridgestone Invitational now defunct, we're losing some of the best trends in golf. Brooks was the 12th winner in-a-row to have finished inside the top-28 at Firestone the week before and he was the 17th winner in 20 years to have already won earlier in the season. Both of those are going to be redundant now. We can probably touch on the second trend going forward but it's not going to be Glory's Last Shot anymore (as the old PGA strapline used to shout) and playing it in May as the second major changes it considerably. With Brooks now winning three of the last seven majors, only 12 of the last 15 have gone to a first-timer but that's still a significant figure given the last 28 majors have been won by someone inside the world's top-50. It may be worth looking for another one to break his duck at Augusta in April but surely Rickie Fowler needs to be swerved at the sort of prices he goes off at? For the umpteenth time Rickie was in-the-mix at a major last week but it was sadly all too predictable as he yet again fell short with a disappointing one-over-par round on Sunday. Will Woods win another major? Following his oh-so-close sixth place at the Open last month, Tiger's second place yesterday was his best performance in a major championship since he was caught and passed by Y.E Yang at Hazeltine in the US PGA nine years ago. It was a fabulous effort this week and although he traded shorter at Carnoustie, he impressed me more here but is he going to get that illusive 15th major championship or has this summer just been the epitome of a dead cat bounce? He'll be 43 next year and the chances are running out fast but he was noticeably lifted by the huge crowds at Bellerive and each time the juices have flown again he's handled the adrenalin better. I'd really like to see him win a regular event first though because I think that would make a huge difference the next time he's in-the-mix at a major and that's certainly not beyond him. The chances of him ever catching Jack Nicklaus' record of 18 are wafer thin to non-existent but another one is certainly doable. Jack's last came at Augusta at the age of 46 so there's time yet for the Big Cat and that's got to be good news for golf fans and TV companies everywhere. Someone might even be prepared to stump up a few quid for the next edition of the US PGA Championship after all. We've got a couple of events to look forward to this week. The Nordea Masters on the European Tour and the Wyndham Championship on the PGA Tour and I'll be back later today or tomorrow with my previews.